What to look for in a translations supplier? For businesses which deal with international clients on a large scale, working with a professional translation agency specialising in business translations has a number of benefits. However, the translation industry is a highly competitive market. The growth in demand for expert translations in recent years has seen an abundance of companies offering language translation services. Unfortunately, many of such companies do not meet the strict requirements needed to provide accurate and reliable business translations. It is therefore essential that you know what to look for when it comes to partnering with a translation agency. This article will help you to prepare the questions you need to ask, and allow you to understand the most important aspects needed to assess whether the language translation company can provide the services to standards which fulfill your requirements. The first step to choosing a translation service is to determine the needs of your business. There are numerous translation services on offer, and some agencies specialise in specific fields, and thus better equipped to meet your business objectives. Important aspects to consider is the language you require (obviously), the target audience (specific destination or country), and the format which you want the translation delivering in (website, brochure, legal documents etc). The reason for knowing your target audience is because different countries have different cultures even if they speak the same language. This can have a significant impact on the type of words and expressions that are most appropriate, together with colours and images. There are also many types of formats you can have material translated into; booklets, brochures, speeches, articles, posters etc. In order to be able to fulfil the requirements of the project, a translation agency needs to have the right tools and skillset. For example, if you have an existing brochure written in your native language, and want to repurpose it to target a foreign audience, the translation agency will need to provide desktop services. When you translate materials from one language to another, the amount of space used is usually different. Therefore, the translation agency needs to tweak the layout of the brochure so that the content fits into the space neatly. When a translator understands the goals of your project, they are better placed to deliver a translation that is fit for purpose. If you have a lot of documents that need translating in a short space of time, you should also make sure the translation agency has the resources to facilitate your project. Professional translators typically translate from a second language into their native language. This is the best way to achieve fluency. Furthermore, translation is not just about the language. Culture plays a large part in communicating with foreign audiences as well. Free-flowing translations are best achieved by native speakers. They alone understand local terminology, idioms, consumer mindset, legalities, sensitivities and all the other subtle mannerisms that emerge from culture. It is the subtle cultural references that make all the difference in translated content. For the very best translations, ensure the translation agency you work with have access to native speakers that can provide an accurate, high-quality translations that gets results. The majority of translations are in fields that require specialist knowledge, e.g. legal, medical and marketing translations. Professional translators therefore have an area of interest they specialise in. When searching for a translation agency, look for companies that provide specialist translations in your sector. There is little use asking a medical translator to prepare a legal document for you and vice versa just because they know the target language. Specialist industries have a language of their own. Translations in these key industries must be precise. Knowledge in these fields is therefore critical in order to deliver high-quality results. Look for proof that the translation agency you use can provide access to translators that are accredited in specialist fields and ask for proof of certification. The cost of translations can vary significantly from one agency to the next. A contributing factor on price depends on the technologies and the expertise a translation agency uses. Costs can particularly be an important consideration for projects that require a high-volume of translations such as websites or the discovery process in international legal trials. Thanks to machine learning technologies, the translation industry has access to translation tools that significantly speeds up the translation process – and in doing so dramatically reduces the cost of translation projects. However, translation machines are a relatively new technology. Most translation agencies didn’t adopt them until around 2015-2016. Some agencies still don’t have them which means they may not be able to handle large volume projects. Furthermore, firms that perform translations without high-speed translation tools take longer to finish the project which is more costly for customers. Rates are based on time spent and the number of staff involved in the process. Translation tools minimize the number of translators required to deliver high-quality translations. Before agreeing to hire a translation agency compare “rates per word” and ask if they offer reductions for high volumes of content. For example, not every page in a legal discovery will need translating by a linguist. You also want to know the fees for technical content, creative content, meetings, reviews and revisions as these can carry premium rates. Confidentiality and data sharing is a subject that is a hot topic in the digital age. Given businesses have to share sensitive data with translation companies, you need to be assured the agency you work with has effective processes that protect your confidential data. Most agencies have a standard practice for translators to sign a non-disclosure agreement (NDA). You also want to know how the information you provide a company is being stored and how well protected the documents are. 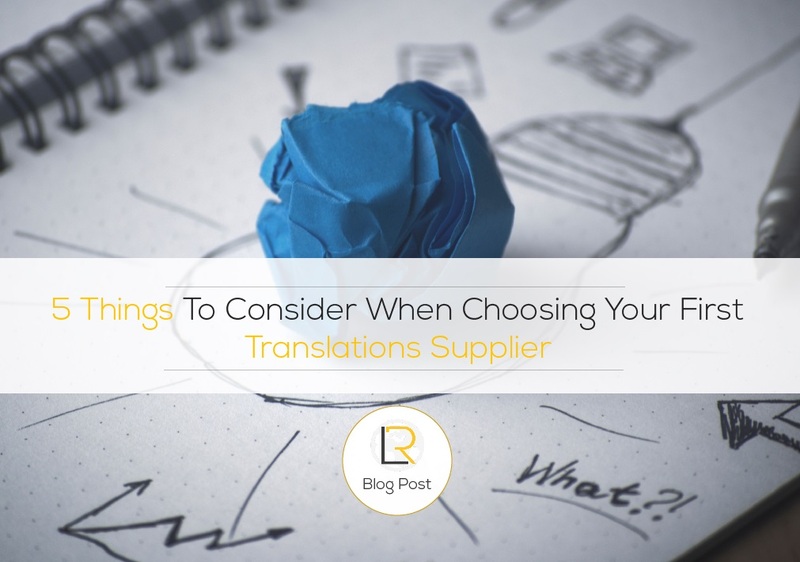 Asking the right questions to prospective translation partners helps you make a decision about which agency to use. Knowing your business objectives enables you to look for agencies that can fulfill your requirements, and subsequent conversations give you a feel for the quality of translations the agency is likely to provide. PREVIOUSTop 10 Fastest Growing Economies In 2018: Where To Expand?